Believe it or not most of binary options trading is based on technical analysis. Technical analysis is the study and measure of historial price action of a financial product in order to make a prediction about its future performance. All the articles and all the strategies about trading binary options touch on technical analysis if not talk about it in its entirety. Yes, yes, fundamentals are important and have a big impact on our trading but it is the technicals that are used for pinpointing entries and determining expiry. The time frames used by the average binary trader are just to short for fundamentals to drive the trades. Increasing expectations for corporate profits may move the market over the course of weeks and months but it is the day to day shifting of the markets that we as binary options traders are capitalizing on. The thing that I love about technical analysis is that you can use it by itself to trade without thought to the fundamentals. The basic premise of TA is that all things are known by the market and that knowledge is represented in the charts. If something is not known to the market it soon will be and that knowledge will then be discounted by the market. This means that all the information available to any trader is represented by price action and if you are good at reading price action you don’t have to worry about the fundamentals. If of course you believe in TA the way I do. It’s hard not to when the results of my analysis proves correct time and time again. So, how do you do TA? It’s actually very easy but can also be quite complex so for this article I will be sticking with some of the basic tools and techniques. Support and Resistance – Support and Resistance are terms that describe areas where prices quit falling or quit rising for a duration of time. Support because as prices fall they become supported by the market; Resistance because as prices rise the market begins to resist those higher prices. One way to think of it is that these are places where the market wants to buy(support) or sell(resistance). These areas are usually denoted by areas of price congestion on a chart or are price levels the market has been unable to move beyond in the past. For the technical analyst these areas are important because once they provide support or resistance once they will likely do so again. In order to use these in your analysis simply draw horizontal lines at any place on your chart that looks like a likely place. This could be at the most recent peak or trough, connecting peaks or troughs of equal height, the top or bottom of a gap in prices or a congestion band as mentioned before. 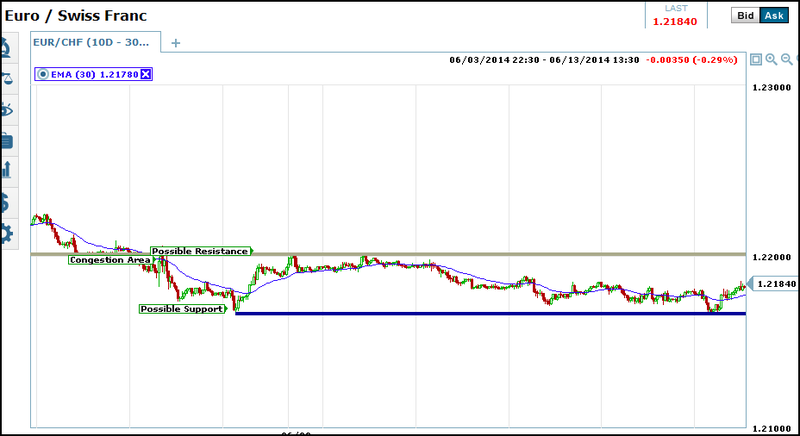 Look at the chart below, I have marked several areas where possible support and resistance may be found. You can see that both the resistance and support lines provided entry points for trading. Trend Lines – Trend lines are very similar to support and resistance lines but they are not horizontal. Trend lines are diagonal lines connecting series of higher and lower peaks. These lines are intended to measure the direction of the market over time and denotes a gradually increasing(or decreasing) price level at which the market wants to buy. An identifiable trend means that it is more likely for prices to move in the direction of the trend than against it. One of the oldest sayings among traders is “the trend is your friend, trade with your friend”. Anytime that prices move away from the trend line and then back to it is a potential entry for binary options traders. 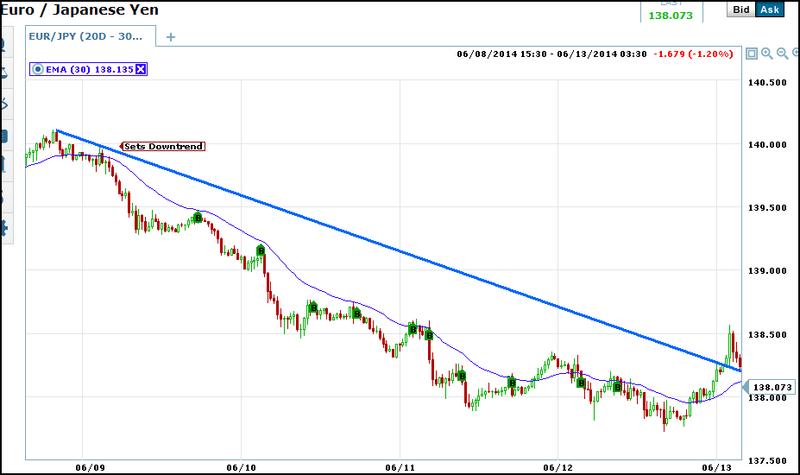 Look at the chart below; after the down trend was set by the first lower peak a continued down trend ensued. Any trend following signal can be taken until the trend is broken. In this case a 30 bar EMA was used to produce 10 or more signals in the span of a week. Oscillators – Oscillators are a very broad category of technical analysis tool but one in which they all share some basic characteristics. For one, all oscillators fluctuate across a central line and/or between two extremes. For another, all oscillators can be used to identify three different signals; trend following signals, potential reversals and to confirm support/resistance. Some basic oscillators include RSI, Stochastic, momentum indicator and the Traders Index. Each is based on a different mathematical equation but all are displayed the same way; a wavy line that moves over and under a central signal line or between two extremes which are in turn used as signal lines. What I have noticed over the years is that most oscillators will also produce similar looking signals, some are easier to read, some come sooner than others. The basic signal an oscillator gives is the crossover. Whenever the oscillator line crosses over its signal line it is giving off a signal. These signals can be either trend following or not so caution is needed when trading solely from an oscillator. Look at the example below. I have a stack of oscillators including MACD, TRIX and Stochastic. Notice how similar the wave patterns are, stochastic seems to be leading the other two which may or may not be good. If it is producing winning signals then yes, if it is producing a lot of false signals then no. The important thing with oscillators is to pick one that you can read comfortably and use to get good signals.